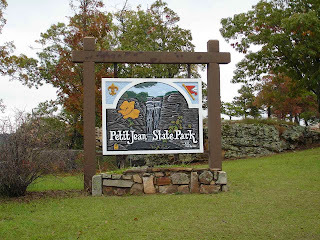 Still on the Arkansas River, we head northwest to Petit Jean State Park. 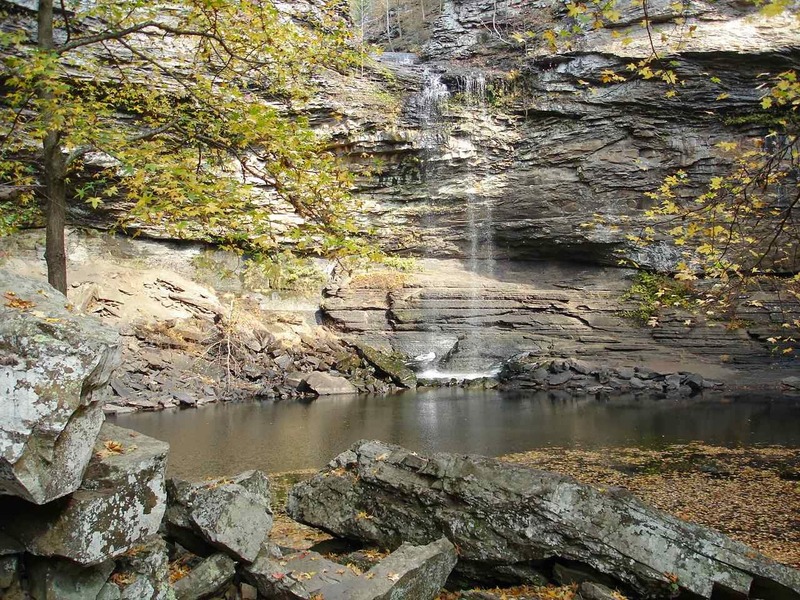 The story of Petit Jean and the first Arkansas State Park may be found here. 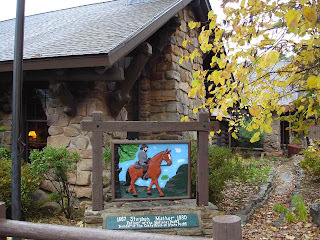 The story of this park also centers around----you guessed it---the Civilian Conservation Corps . 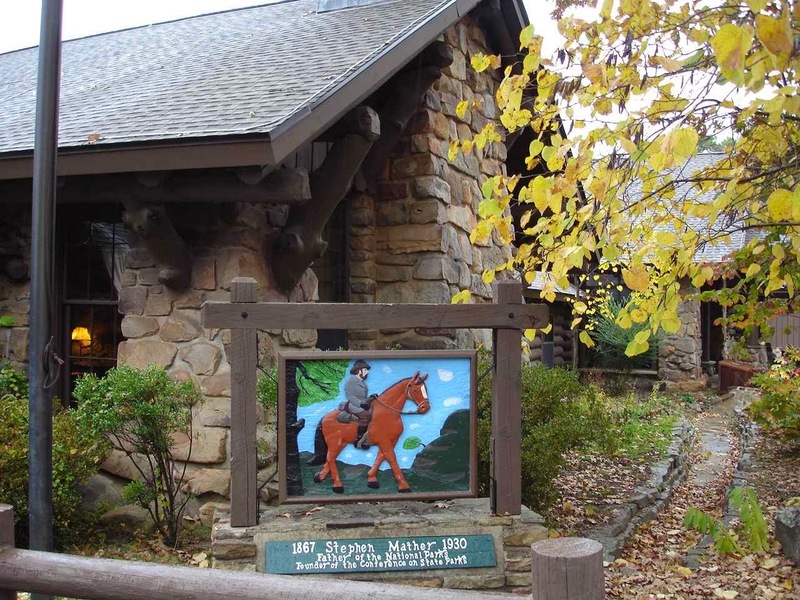 This visitor's center building was from that period--in this case 1933 to 1941. Just as a note, after the stock market crash in 1929, the unemployment figures reached 23 per cent by 1932. Part of the New Deal of Roosevelt was to put these millions of workers back to work. This CCC camp was 200 men , working for $1 per day. 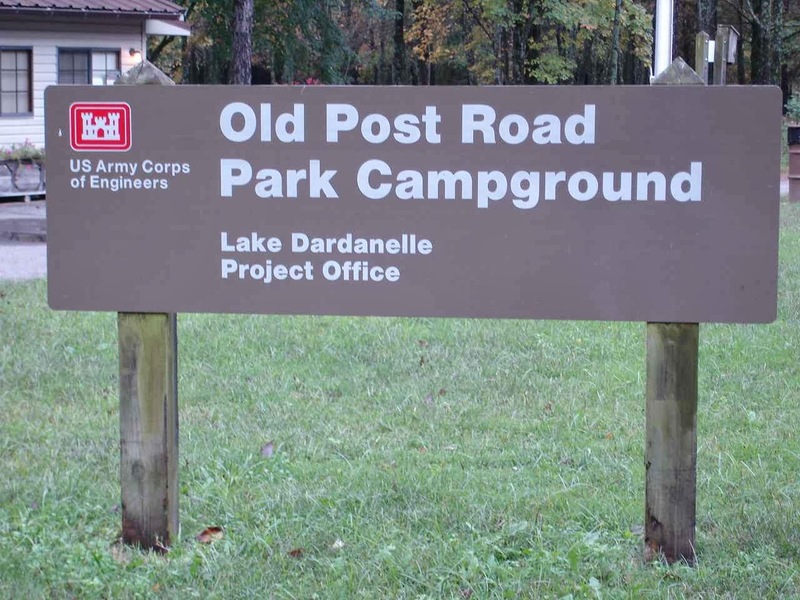 While most other camps were young men between 17 and 25 years of age, this camp was mostly men between the ages of 35 and 45 . 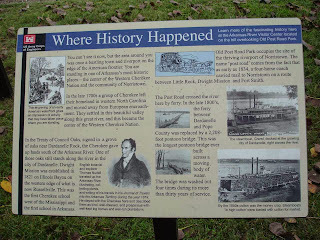 Most were native Arkansans and had wives and children. 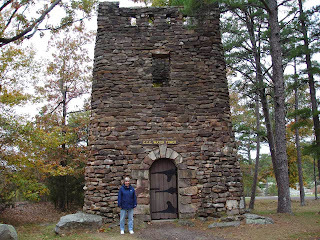 Jan and I had a long hike in the rain from our campsite through the CCC ruins---old chimneys and stone work from the old camp---to the Mather Lodge. The old section of the lodge dates from the CCC period and the newer sections fit right in. 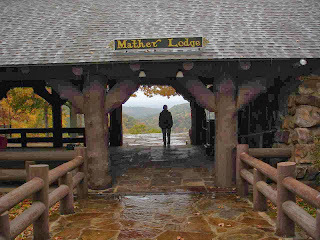 This sign for Stephen Mather reminded us of Mather Point at the Grand Canyon. He was a very important key to the beginnings of the national park system. 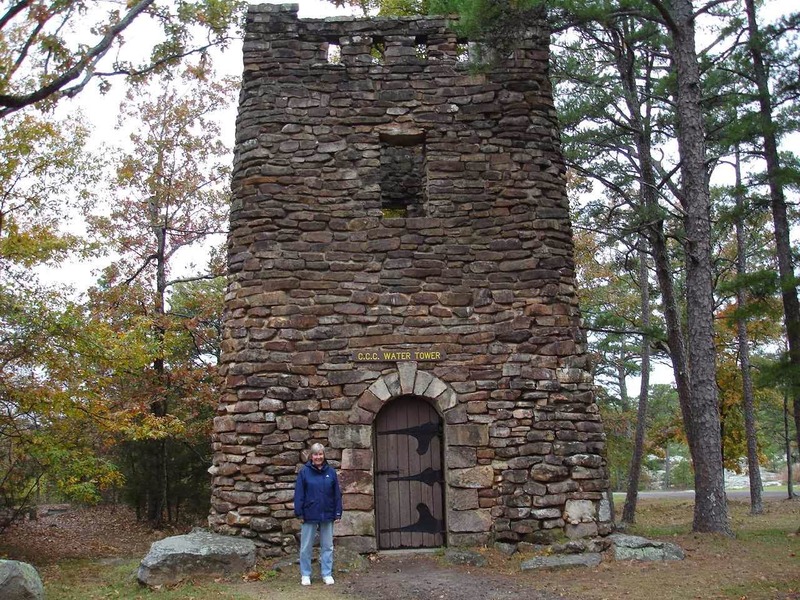 In this instance he is noted for also being the Founder of the Conference on State Parks. 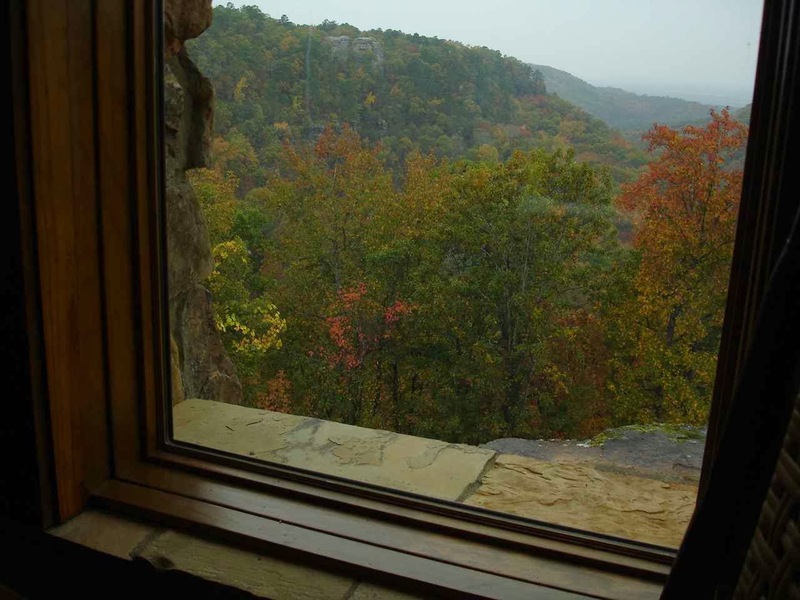 The lodge is perfectly located for a magnificent view towards the Arkansas River valley. Rainy day or not, the view is still breathtaking. 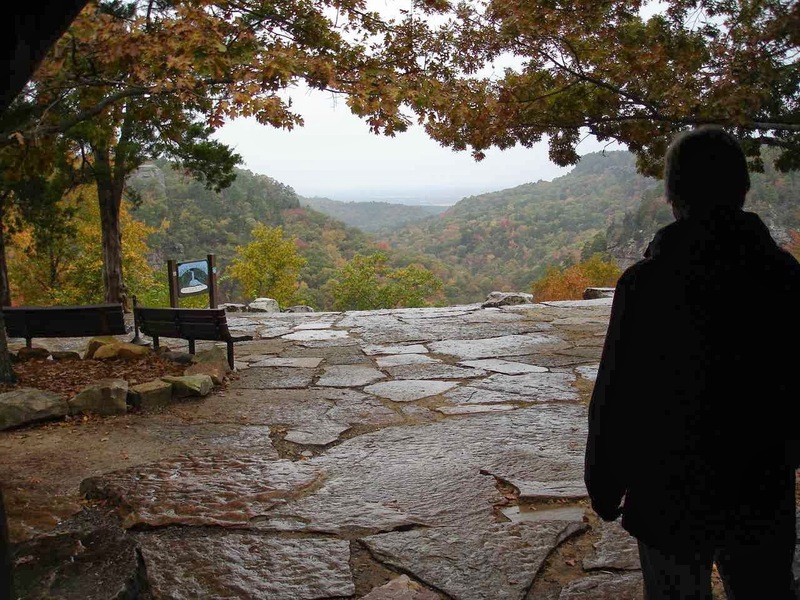 However, we do decide to take a rain check on hiking down the steep and slippery trails. Instead we head right, into the lodge through the old lobby of the original building. 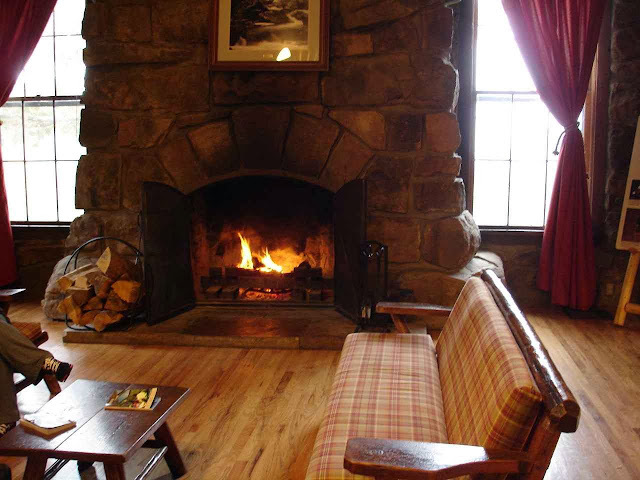 On a cold , rainy day the fire is a welcome sight. At the restaurant in the lodge, the menu advertises chicken noodle soup. We add a few french fries and onion rings in order to enjoy this view from our table. If it had not been raining, we might have hiked down to the falls. This picture was taken on our earlier trip in 2007. 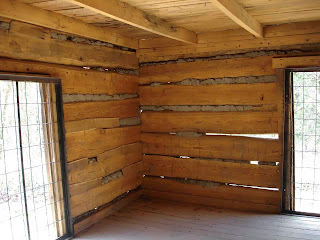 Also on the property is this old pioneer cabin from 1845. 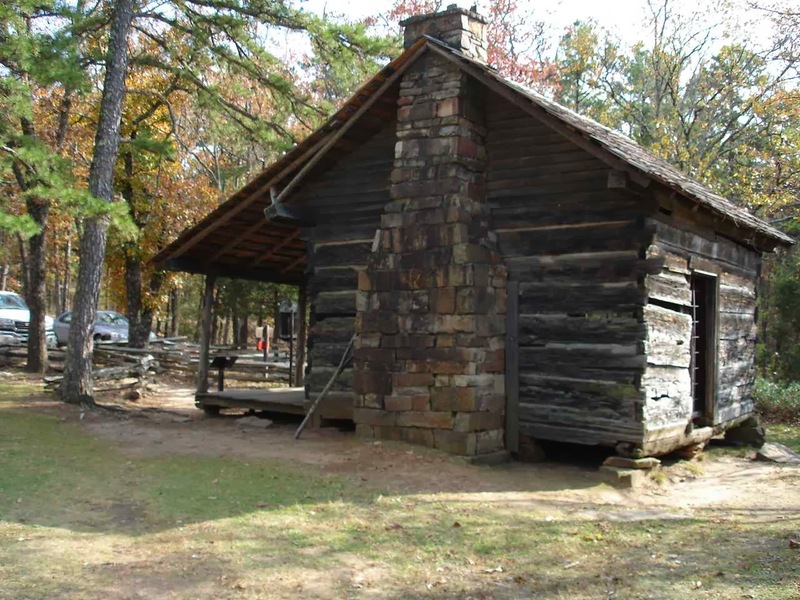 It has been well maintained and is used to show a real cabin where Owen and Jane West reared 9 children---5 of whom were born in this cabin. 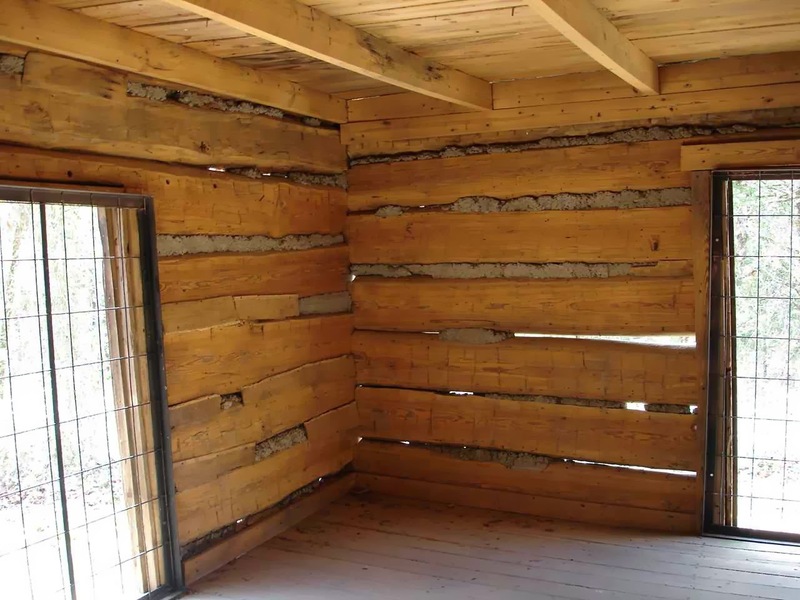 Back in the 1800's, these walls were probably fully sealed --no see through holes. However, it gets cold in Arkansas and we could imagine this being quite chilly, even with 11 people inside. We had to throw in another picture from 2007 on a sunnier day. This view from just east of the state park shows the flat and fertile farmland with the Arkansas River in the distance. 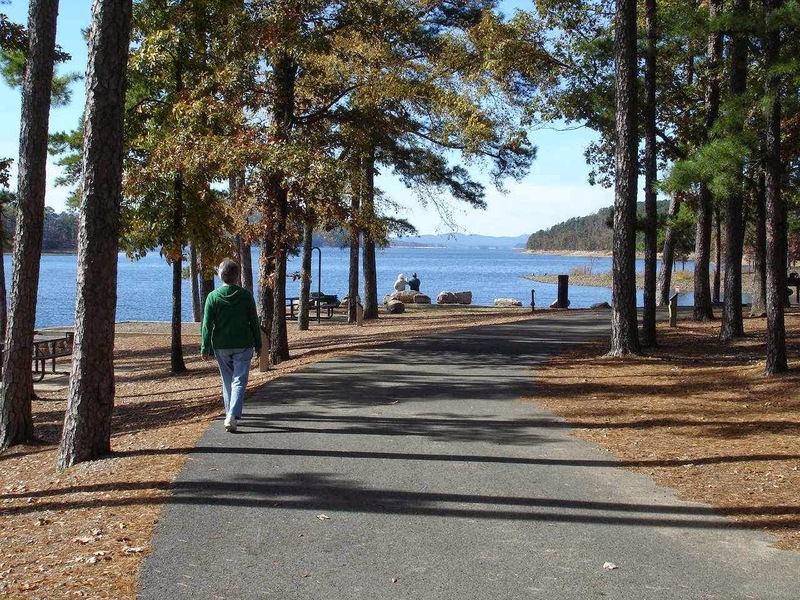 After Petit Jean we head west on back roads towards Russellville for Old Post COE park on the Arkansas River. Once again, with the Old Folks pass, we find a nice site backed up to the Arkansas River. All for $10 per night. 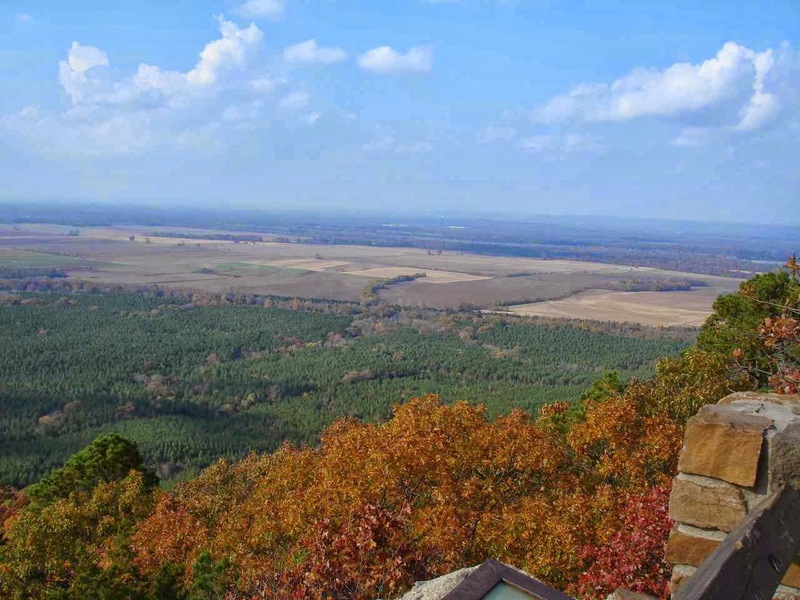 By the way, our travels on the back roads indicate that Arkansas can have some pretty bright and colorful foliage in early November. Our comfortable little campground is connected to a large public park run by the COE. 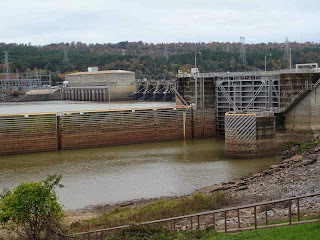 All of the area is maintained for the public around this dam and lock and also hydroelectric plant. This area was an important crossroads in the 1800's. 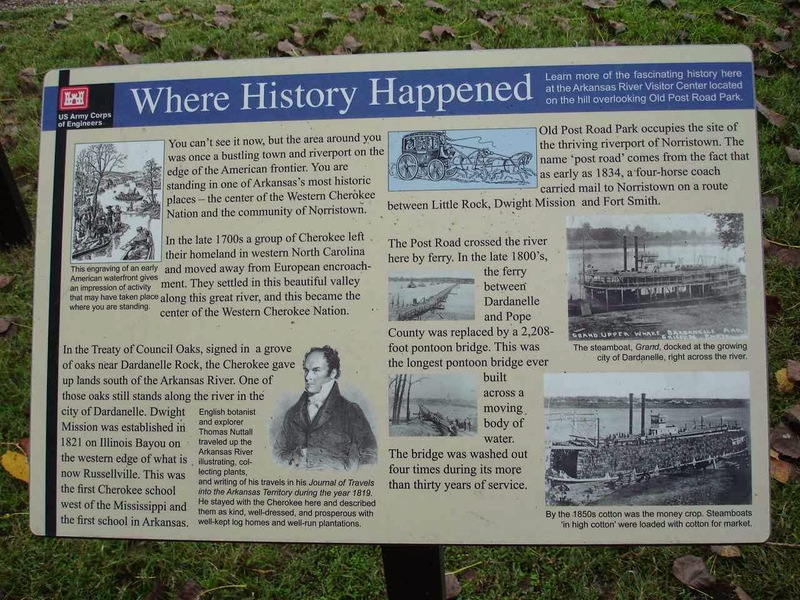 The local signs remind us that this is part of the Trail of Tears. That is the name given to the trail that the Indians were forced to travel to Oklahoma. Not our country's finest moment. Just like back in New England, the Old Post Road refers to the old coaches carrying mail--in this case from Little Rock west. The main building for the COE also houses a small museum. 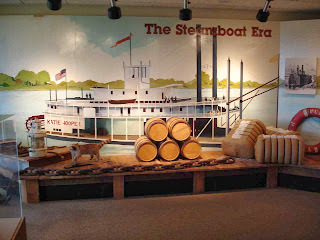 A lot of space is given to the steamboat era which began about 1820. 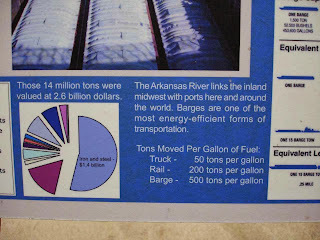 We don't see as many barges on the Arkansas as we did on the Mississippi, but there a number that go by our campsite each day. 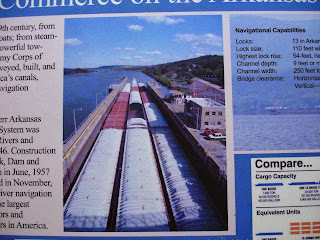 Jan ran out and up to the locks to get this picture of one going upstream into the locks. 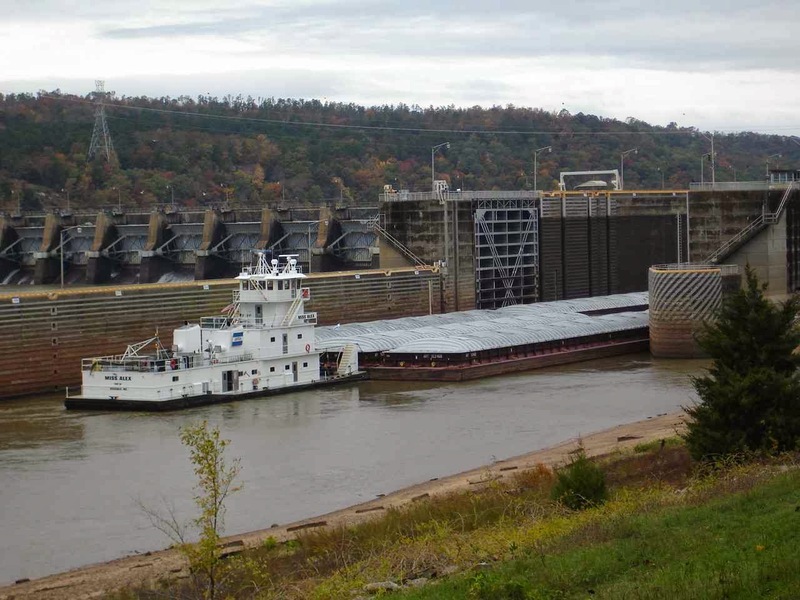 The locks will raise about 5 stories and the barges will continue on upstream. We can not get close enough for this picture. 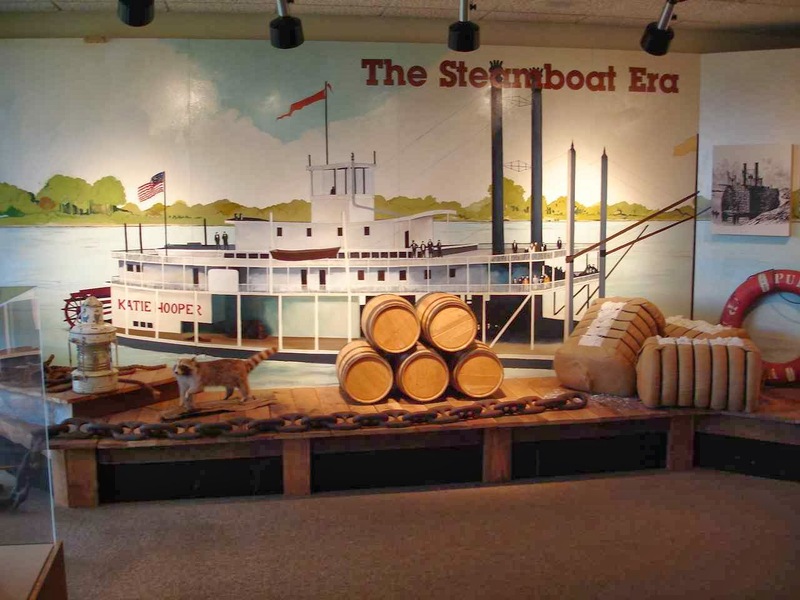 But the museum shows a set of barges in the lock. 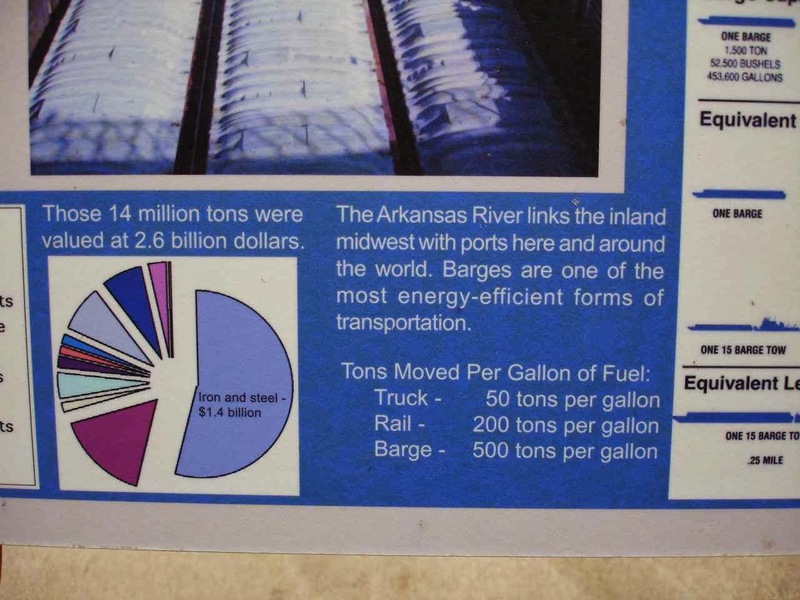 We used to wonder why they would still use barges in the modern era. This chart would seem to indicate why. The hydroelectric plant can produce 100,000 megawatts of electricity per month. This is enough to power 80,000 homes. 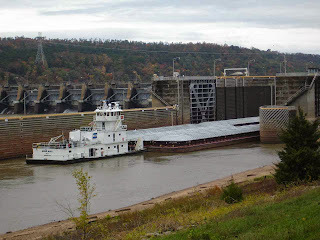 Hydropower plants burn no fuel. There is no cost for coal or oil and there are no global warming gasses produced. It reminds us of the plans noted when we visited Campobello Island for a tidal power plant. 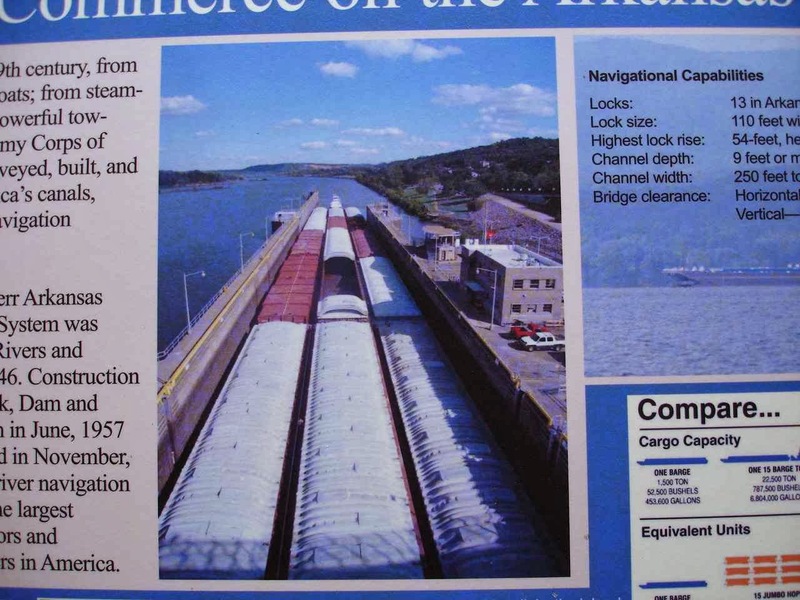 Plans were drawn and the idea seemed good with cooperation between Canada and the US. 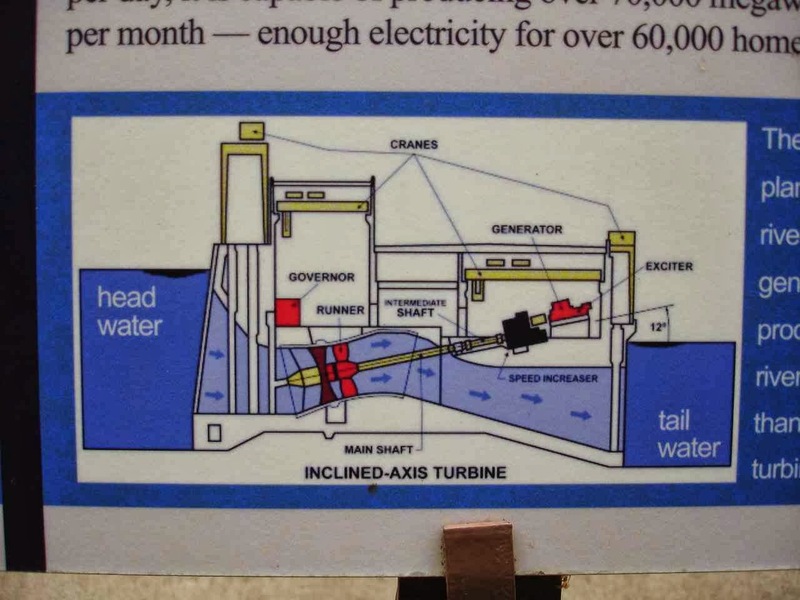 The 20 plus foot tides would seem to guarantee cheap electricity. But the plans never turned into reality and the cost became prohibitive for building the plant. 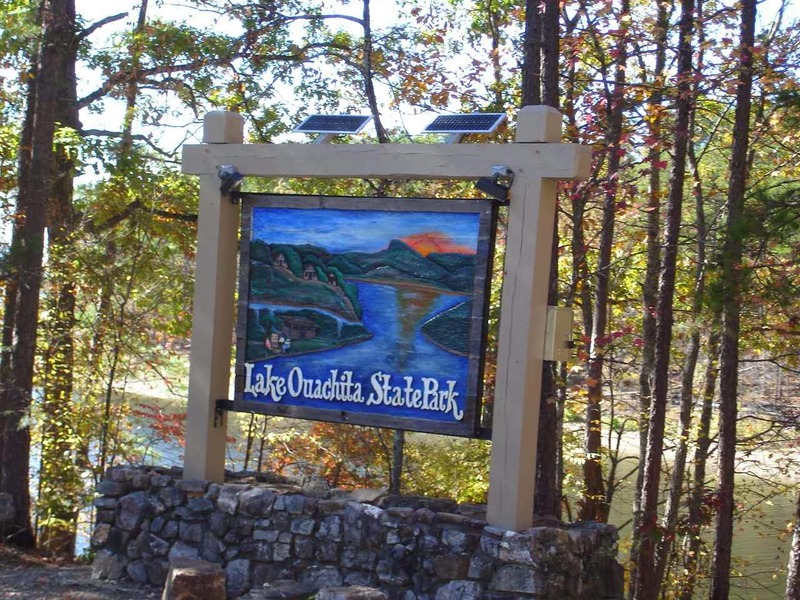 From Russellville, we head south over more back roads to Lake Ouachita. We would like to pronounce it Wacheetah. But the locals like to accent the first syllable for Wash' i taw. 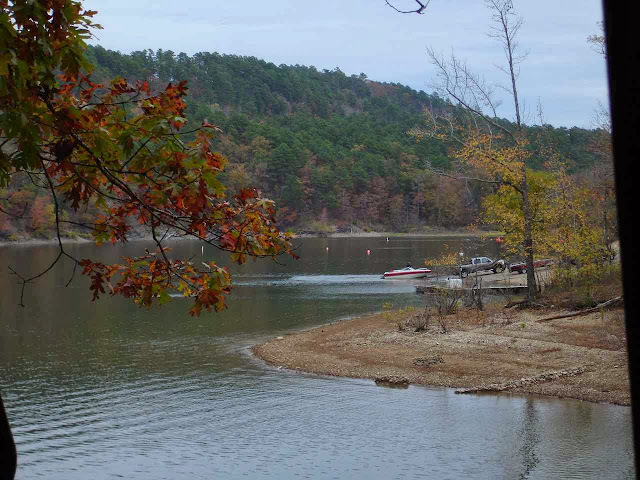 It is another large wandering lake in west central Arkansas. 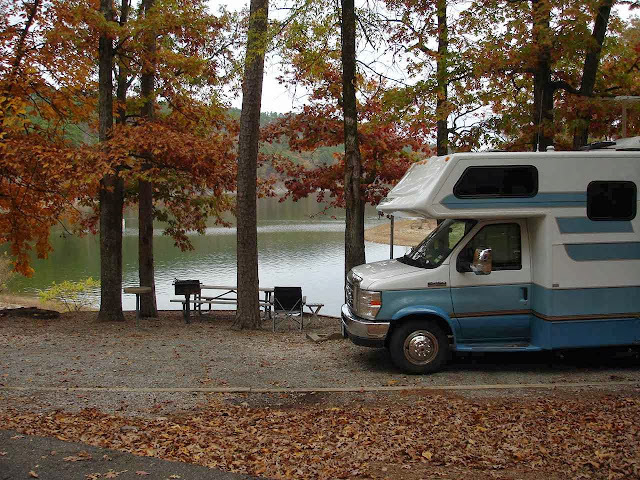 Generally speaking, we have found state parks to be more expensive--sometimes on a par with private campgrounds. 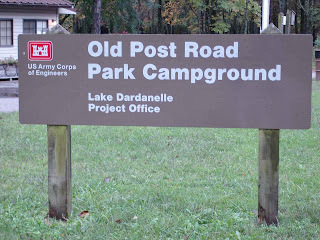 But we are happy to note that this state park gives us an electric and water site for $15.68 --weekday and out of state senior rate. There are no cars allowed on this road through the tenting area. Even the tenters have to park outside and carry in their gear. But what beautiful sites. For RVers, we would recommend Area B on top of a hill --no hookups--for smaller self contained units. And that brings us back to COE parks. We are now in Crystal Lake COE park in Crystal Lake. 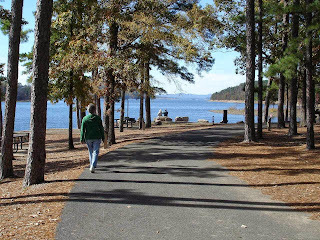 This is on the southern shore of Lake Ouachita. Great separation between sites with lots of privacy for $10 per night. We can sit and watch the boat launch area across the way. This is from our living room. There are a large number of boats each day ---all fishing boats--mostly bass boats. The lake is noted for superior fishing for bass, crappie, bream, and catfish. 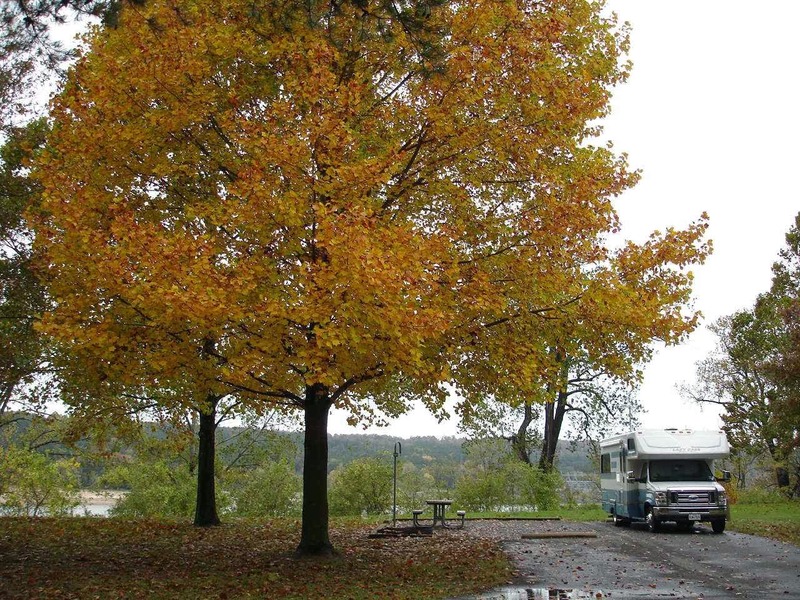 It is also stocked with smallmouth bass, walleye, and stripers. We think we will just sit back for the weekend and enjoy! 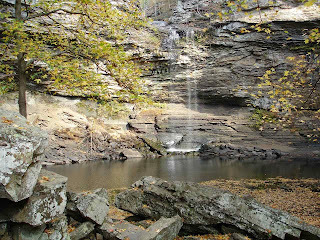 I recently discovered your blog, and am enjoying your experience in Arkansas, our home this past year. We recently completed a fall trip and stayed at four of Arkansas state parks. Their weekday rate for us geezer residents makes them as cheap as the federal parks and facilities. Our stay choices were limited due to the federal shutdown, so we didn't get to as many COE places as we would have liked. 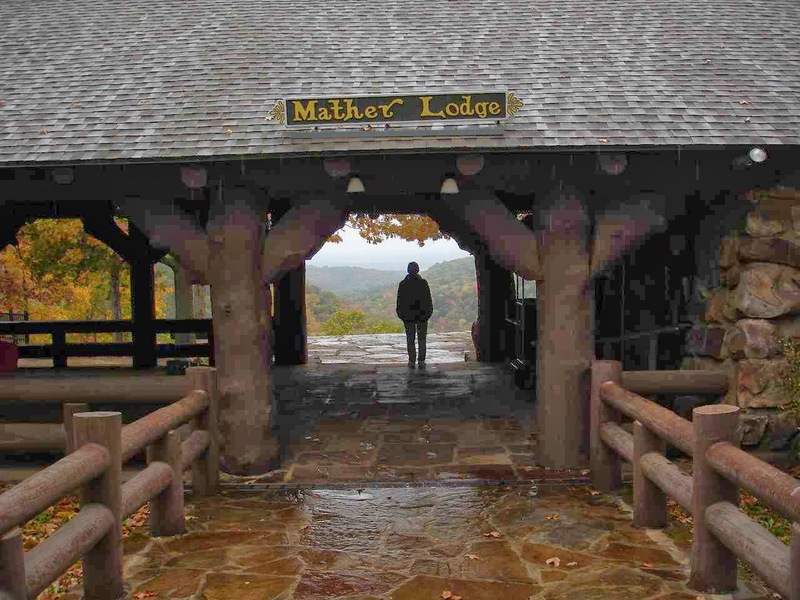 We too had a nice lunch at the Mather Lodge at Petit Jean, plus had a day without rain, enabling us to get out and hike a bit. I too have a blog, but give my self a C- or D+ on content. The way blogger works, I can't see my last post, as I write a new one. I get confused, but at least the family knows we are still alive as we meander. We want to head south sometime soon, and the Ouchita area looks good to us.